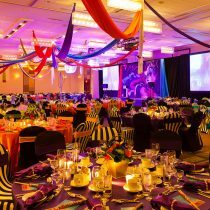 Themed events are one of our core specialties at Eclectic. With a renowned creative design team, our cutting-edge theme events and concepts win over clients and audiences time and again… and win awards. Specializing in the art and science of blending the perfect thematic entertainment with decor design and audio-visual, we will transport your guests to another time or place, creating the ultimate theme event. With our finger on the pulse of what is current and being known as industry trendsetters, one of our strengths is in the custom creation of theme events. We are able to take your brand, product or service and customize every element of the theme so that it specifically speaks to and represents with creative perfection. Even if you’ve developed a theme of your own, we can work together with you to build and communicate your vision, bringing it to life for all your guests. We are able to take your brand, product or service and customize every element of the theme so that it specifically speaks to and represents with creative perfection.